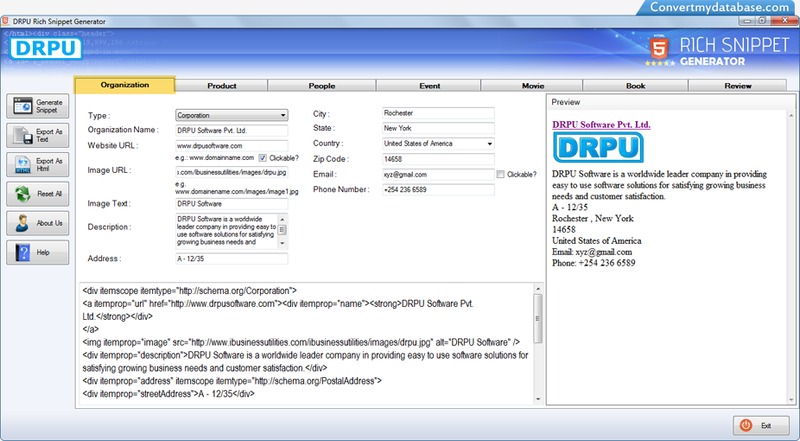 Rich snippet generator software generates search engine friendly rich snippet and microdata code for your websites. Google and many other search engines utilize markup data for helping users to find more information on a variety of subjects including people, products, events and reviews. Using microdata generator program you can successfully generates micro data that allows you to better recognize and display your information in search engine organic result page. Rich snippet provides simplified way to give optimized data to the search engines in order to enhance your listing in organic search engine. Rich snippet generator software generates rich snippet code for inserting rich data snippets about your organization, product, people, event etc. Empowers to generate Google compatible microdata code and rich snippets for your websites. Provides option to export code in txt file or html file format according to your requirement. Helps you to increase your website listing in search engine (Google, Yahoo, Bing, MSN etc) result page by adding stars and other rich content to your website. Provides automated way to Generate Search Engine Friendly Rich Snippets.